Where Is Santa right now? Ask his elves! can help you find him! Where Is Santa Claus now? I guess that depends where you left him! Oh, I sleigh me with that silly joke! Ok, ok, can't a grumpy elf tell a joke?! So where is Santa Claus right now? Right now, Santa is very busy doing his stocking stuffing exercises! How Else Can I Find Santa? emailSanta.com's Santa Tracker: Live reports on what Santa is doing and where he is, year-round. 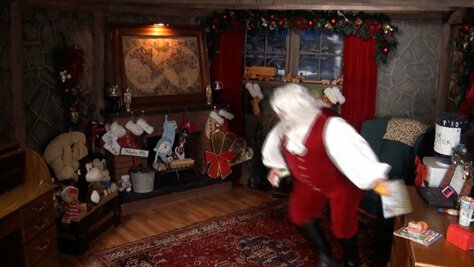 emailSanta.com's Santa Claus Webcam: Video feed from Santa's North Pole office showing what he is doing. emailSanta.com's Santa Webcam App: In the App Store, a video feed from Santa's North Pole office showing what he is doing. emailSanta.com's Christmas Eve Santa Snooper: Elf-testing mode year-round. Live connection to Santa on Christmas Eve. NORAD Santa Tracker: Webpage active Dec. 1st. Santa tracking Christmas Eve. Google's Santa Tracker: Website active year-round. Santa tracking Christmas Eve. Airservices Australia tracks Santa: Website active year-round. Santa tracking Christmas Eve. Click to make a NEW game! Word List For Where Is Santa? Here's a list of all the words that might come up in this puzzle. For bonus points , keep playing new games until you've found them all!